12 Months of Exclusive Content Direct From Studios and Distributors! SciFi Japan is proud to remain the one and ONLY English language website devoted to Japanese fantasy films and TV that is officially press registered with all five major Japanese studios (Toho, Toei, Shochiku, Nikkatsu and Kadokawa), several Japanese production companies, plus their distributors and licensees. While other sites will run information and images taken from Japanese news sources and publications, SciFi Japan regularly posts content provided directly to us by the companies and people making and releasing Japanese movies, programs and merchandise. This allows us to present our readers with accurate, verified information rather than rumors and speculation, and also run larger and higher quality photos and artwork than can be found elsewhere. Thanks to all our writers, contributors, sources and readers for your support! Be sure to check back with SciFi Japan often in the weeks and months ahead… we’ve got even more exclusives lined up for 2019! Asmik Ace is engaged in production and distribution (theatrical, video & DVD, and TV sales). Kadokawa Pictures, a subsidiary of the giant Kadokawa Corporation, produces live action pictures and animated films. Kadokawa acquired Daiei (the studio that created the Gamera and Daimajin series) in 2002. When I get home, my wife always pretends to be dead. Film Partners. All Rights Reserved. Netflix is the world’s leading internet television network with over 100 million members in over 190 countries enjoying more than 125 million hours of TV shows and movies per day, including original series, documentaries and feature films. As one of the oldest Japanese production and distribution company, Nikkatsu has celebrated its 100th anniversary in year 2012. Today, Nikkatsu’s diverse business activities include operation of the production studio, overseas film acquisition, distribution, a cable TV channel (Channel NECO) and a Film Course at Josai International University. It is also a member of the Yomiuri-Nippon TV group, the leading media conglomerate in Japan. SSSS.GRIDMAN. Image courtesy of Pony Canyon. Pony Canyon is a part of Fuji Media Holdings Inc. which is Japan’s largest and most influential media conglomerate. The company co-produces films and also develops digital software, utilizing the latest interactive and multimedia technology. Shochiku traces its origins to 1895 when Takejiro Otani presented his first stage play. They also produced the first color motion picture in Japan, and have expanded into TV dramas, video contents, Kabuki presentation, theater operations, and real estate. Shochiku handles theatrical distribution in Japan for Tsuburaya Pro’s Ultraman movies. LAUGHING UNDER THE CLOUDS. Image courtesy of Shochiku. ■ Showgate Inc./Hakuhodo DY music & pictures Inc.
IMPOSSIBILITY DEFENSE. Image courtesy of Showgate Inc. Established in 1951, Toei is one of the Japanese majors in cinema, covering production, distribution and exhibition through its own theater chains. The company owns two film studios and has a library of over 20,000 titles including feature films, TV series and animation. Founded in 1932, Toho Co., Ltd. is one of the leading entertainment conglomerates in Japan. Besides film production, Toho also distributes Japanese films (earning the highest box office receipts for decades in Japan) as well as foreign films through its subsidiary, owns first class movie theaters throughout Japan, produces legitimate plays and musicals, and has more than 100 entertainment-related subsidiaries. THE CRIMES THAT BIND. Image courtesy of Toho Co., Ltd.
© Keigo Higashino/KODANSHA All Rights Reserved. PENGUIN HIGHWAY. Image courtesy of Toho Co., Ltd. Founded in 1928 by Japanese film pioneer Nagamasa Kawakita, Toho-Towa Company Ltd. is proud of its history of presenting the best international movies to audiences for more than 80 years. Toho-Towa is Japan’s oldest and leading motion picture importer and distributor. Toho-Towa is a subsidiary of Toho Company, Ltd., Japan’s pre-eminent entertainment corporation, the activities of which span motion pictures (production, distribution, and exhibition), television, video, music, stage and related fields. Since 2007, Toho-Towa has theatrically been distributing Universal titles in Japan. 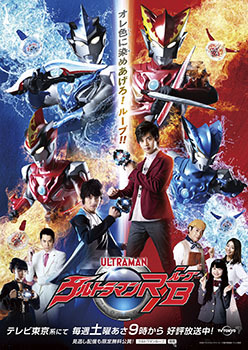 Tsuburaya Productions, creator and copyrights owner of the superhero ULTRAMAN series was founded in 1963 by Eiji Tsuburaya, world-renowned special effects wizard also known for his special effects work on the Godzilla series. In addition to production, the company also handles character licensing and program distribution and staging live stage shows both domestically and internationally. 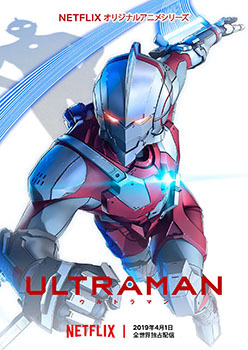 • ULTRAMAN R/B Update — New Characters Announced! 20th Century Fox Film produces, acquires and distributes motion pictures throughout the world. These motion pictures are produced or acquired by the divisions Fox 2000 Pictures, Fox Searchlight Pictures, Fox International Productions, Twentieth Century Fox Animation and Blue Sky Studios. Universal Pictures is a division of Universal Studios, part of NBCUniversal. NBCUniversal is one of the world’s leading media and entertainment companies in the development, production and marketing of entertainment, news and information to a global audience. NBCUniversal owns and operates a valuable portfolio of news and entertainment networks, a premier motion picture company, significant television production operations, a leading television stations group and world-renowned theme parks. NBCUniversal is a subsidiary of Comcast Corporation. Warner Bros. Pictures produces and distributes a wide-ranging slate of some 18-22 films each year, either fully financing or co-financing the films it produces and maintaining worldwide distribution rights. Their subsidiary Warner Bros. Pictures Japan also co-produces and distributes films in Japan. • GODZILLA: KING OF THE MONSTERS Trailer and Production Info From Warner Bros.
• GODZILLA: KING OF THE MONSTERS Official Photos From Warner Bros.
Warner Bros. Pictures. © 2018 Pokémon. • POKÉMON DETECTIVE PIKACHU Update From Warner Bros. The Japanese collectibles company X-Plus produces high quality figures and statues based on the giant monster franchises of Toho, Tsuburaya Productions and Kadokawa (Daiei). X-Plus has provided SciFi Japan with exclusive previews of their latest releases since early 2013. • X-Plus Giant Monster Figure Lineup for March 2018 — Updated and Expanded Edition!